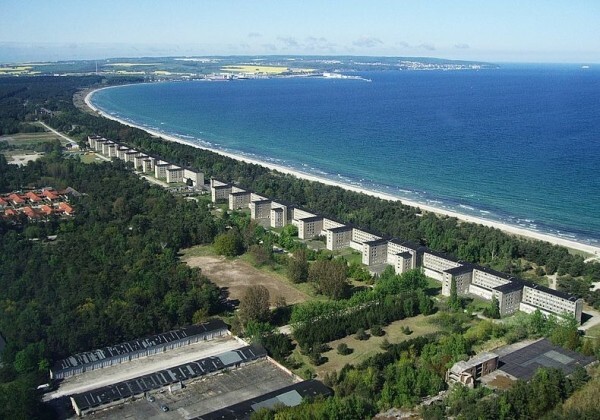 World’s biggest hotel Prora is located on the sea island of Ruegen a Baltic sea resort in Germany. It has 10000 rooms, all facing the sea front. The resort was constructed between 1936 to 1939 on Adolf Hitler’s theme ” Strength Through Joy” to keep the Germans forces in high morale, healthy and happy. Although it has a beautiful location, but no one has ever stayed here since the end of 2nd world war. The location is just five hundred feet from the sea front and spreads over 5 square KM area. It was made with the intention to accommodate 20000 soldiers at any time and that German forces could live in an healthy environment. It was to house in 10,000 rooms soldiers aimed to be fit and strong for production of any type ( mainly for war pourpose). No holiday-makers ever stayed at Prora. Its eight housing blocks, theaters, cinemas, swimming pools and festival halls remained empty since their inception. During the war some people from Hamburg whose houses were damaged or destroyed had used it as a stop over. The East German army used a section of it as an outpost. All the big companies of that time (1930s)had participated in building this hotel. At a time 9000 laborers were employed. All of them were sent to manufacture weapons during the war. After unification in 1990, the condition of the the buildings was found to be precarious, the roofs leaked, and the paint peeling off. The windows were either broken or damaged, the roofs were leaking and the plaster was crumbling from the walls. But the monumental steel and concrete structure planned as a Nazi-era holiday complex has survived otherwise unscathed. The plans are ready to give a face lift to the area. A youth hostel has been added for tourists. For its prominent location, the resort has attracted many builders from the private sector and two sections have been sold for real estate purpose. On the whole it seems the future holds good for this place as a tourist attraction.